With its clear plastic body and black trim, the uni-ball Power Tank might look like an average “premium plastic” pen, but there’s actually a bit more going on inside the barrel. The Power Tank uses a pressurized ballpoint ink refill, similar to the Fisher Space Pen, the Pilot Down Force, and the Tombow Airpress. This means that, like these other pens, the Power Tank can write upside-down or on rough, wet, and dirty surfaces. But unlike these other pens, which typically cost around 10 dollars, the Power Tank can be easily found for about $2.50 per pen – the least expensive pressurized ballpoint on the market. 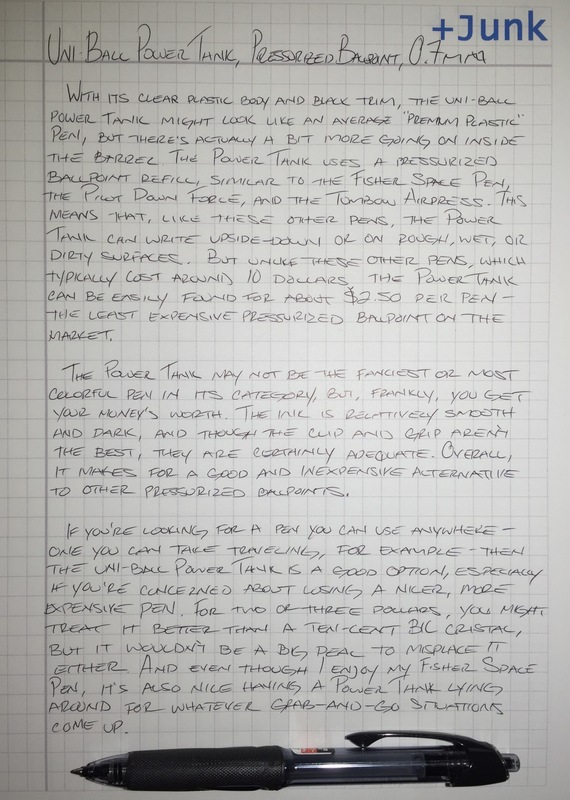 The Power Tank may not be the fanciest or most colorful pen in its category, but, frankly, you get your money’s worth. The ink is relatively smooth and dark, and though the clip and grip aren’t the best, they are certainly adequate. 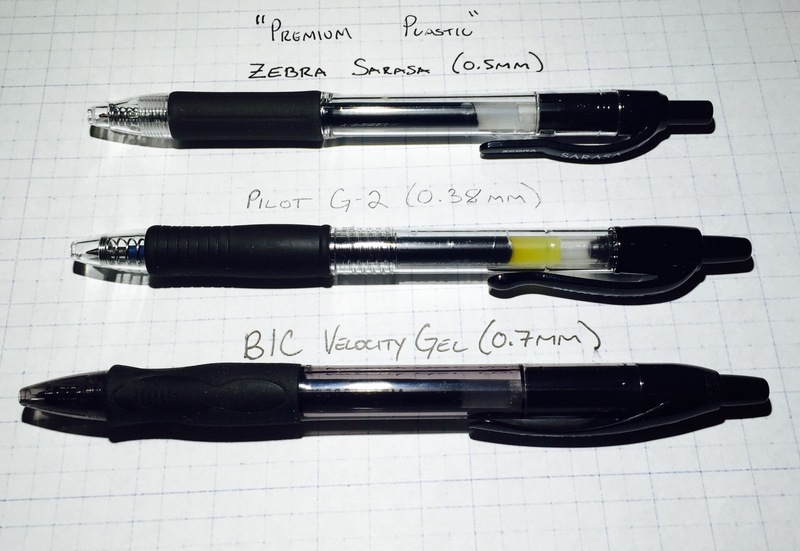 Overall, it makes for a good and inexpensive alternative to other pressurized ballpoints. If you’re looking for a pen that you can use anywhere – one you can take traveling, for example – then the uni-ball Power Tank is a good option, especially if you’re concerned about losing a nicer, more expensive pen. For two or three dollars, you might treat it better than a ten-cent BIC Cristal, but it wouldn’t be a big deal to misplace it either. And even though I enjoy my Fisher Space Pen, it’s also nice to have a few Power Tanks lying around for whatever grab-and-go situations come up. A funny review at The Ruminator. A positive review overall, but he doesn’t like the name. On the contrary, I think the Power Tank is a really cool name for a pen. A review at Pen Paper Ink Letter with lots of pictures. I agree with the overall opinion here – I don’t think it would have a place as my “everyday” pen, but it’s definitely a no-brainer if you feel the advantages of a pressurized ink cartridge would be useful. So, uni-ball originally made a capped version of this pen? Legomac has some info on it, but they are apparently very difficult to find. I’m okay with that, as I’d rather have a retractable model anyway.